1999 Leonid storm as seen from high-altitude aircraft. 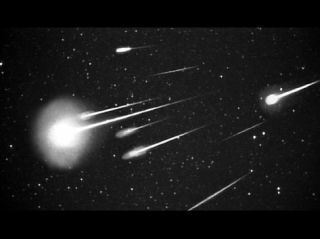 NASAis assessing the risk to spacecraft posed by the upcoming 2011 Draconid meteor shower,a seven-hour storm of tiny space rocks that has the potential to ding majorEarth-orbiting spacecraft like the crewed International Space Station and HubbleSpace Telescope. Themeteorshower risk assessment is actually more art than science, and there has beensome variation in the projected intensity levels of the 2011 Draconids bymeteoroid forecasters. But spacecraft operators are already being notified toweigh defensive steps. Currentmeteor forecast models project a strong Draconid outburst, possibly a full-blownstorm, on Oct. 8, 2011, according to William Cooke of the Meteoroid EnvironmentOffice at NASA's Marshall Space Flight Center in Huntsville, Ala.
TheDraconids do present some risk tospacecraft, Cooke confirmed. They could potentially become the nextsignificant event in low-Earth orbit as far as meteoroids are concerned, he added. Cookeand Danielle Moser of Stanley, Inc., also of Huntsville, presented theirDraconid data at Meteoroids 2010 - an international conference on minor bodiesin the solar system held May 24-28 in Breckenridge, Colo. The conference was sponsoredin part by NorthWest Research Associates/CoRADivision, NASA, Los AlamosNational Laboratory and the Office of Naval Research. Theyearly Draconidsare not known for their bright meteor displays, Cooke said. Predictedintensity rates for 2011 span an order of magnitude, he added, with maximum ZenithalHourly Rate, or ZHR, ranging from a few tens to several hundred as viewed by asingle observer. AMarshall Space Flight Center Meteoroid Stream Model based on radar and opticalobservations of past Draconid showers suggests that the maximum rate will beseveral hundreds per hour. Cookesaid that a significant fraction of spacecraft anomalies produced by showermeteoroids are caused by electrostatic discharges when meteoroid meetssatellite. Andwhile no spacecraft electrical problems were reported during the strong Draconidoutbursts of 1985 and 1998, he said that the lack of past anomalies should notbe taken as carte blanche for satellite operators to ignore in 2011. Thechance of electrical anomalies is low, however, due to the Draconids slowspeed, Cooke pointed out. "We'realready working with NASA programs to deal with spacecraft risk," Cookesaid. "I imagine when the word gets out there will be a Draconid outburst,I'll get the usual calls from comsat companies as well as government spaceprograms," he told SPACE.com. TheInternationalSpace Station ?is heavily armored against orbital debris. Thatbeing the case, "we don't expect anything to go wrong there," Cooke said. However,the Draconids will appear above the Earth's limb making it a spectacularlooking out-the-windows celestial show for the space station crew. "Ihave no concerns about the space station. Even if the Draconids were afull-scale meteor storm I would be confident that the space station programwould take the right steps to mitigate the risk," Cooke said. Themost radical step would be to reorient the space station, Cooke said. "Butfrankly, given the flux levels, I don't think they are going to have to do that,"he added. "But that's their call. I'll give then the flux levels and they'llmake the decision." Onemeasure that space station officials could take, he added, is not to perform spacewalksduring the shower. Forthe HubbleSpace Telescope, if its operators deem the risk high enough, they willpoint the observatory away from the Draconid radiant ? the point from which theshower appears to emanate. "Anytime you take a mitigation strategy, like changing a spacecraft's attitude orturning off high-voltage, that incurs risk as well," Cooke said. Eachspacecraft is unique, and components have differing damage thresholds, so programsare encouraged to conduct analyses to determine whether or not mitigationstrategies are necessary for their vehicles ahead of next year's Draconids. Cookesaid that the spacecraft threat from meteor showers in the past ? particularlythe 1998 Leonids ? produced more hype than hypervelocity impacts. "Wereally didn't understand what was going on," he added. "Now we have amuch better feel. But the Leonids did sensitize spacecraft operators to worryabout meteor showers. Perhaps, sometimes, they worry more than they should." Inearly 2011, Cooke said that he'll be revising his Draconid prediction ? also makinguse of data from other forecasters around the globe ? which will be released tospacecraft operators. "There'salso an awful lot of windage in there too," Cooke added. "We're likethe weather reporters?our forecast changes?and the general trend is alwaysdownward," Cooke said. "Becausewe can now forecast them, we have a way of putting it. If you are hit by asporadic [meteor], it's an act of God. If you are hit by a shower meteoroid, it'san act of negligence," Cooke said.